Hello everyone and Happy Valentine’s Day! I love re-purposing old frames. 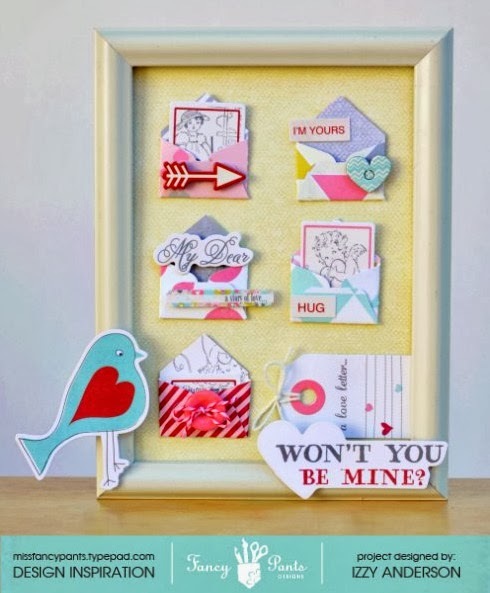 Today I am up on the Fancy Pants Designs blog with a Valentine project using a standard 5 x 7 inch wood frame. I got the idea to do a frame of little love letters after finding this McGill envelope punch at a thrift sale for $3. It makes the cutest little envelopes. I punched several envelopes from double sided paper from the Be Loved collection from Fancy Pants Designs. It's such a sweet collection. I love the mix of yellow, aqua and grey with traditional pink and red. The base of the project is the pretty yellow side of the Adoration paper from Be Loved, trimmed 5 x 7 inches to fit a standard frame. I added the mini envelopes I had punched then decorated them with buttons, stickers and ephemera. After the piece was complete, I added a bright blue bird and a sentiment to the outer frame. Here’s another look at the final project. Thanks so much for stopping by! I hope your day is extra sweet! soooo cute! Love your project Izzy! Super cute! The envelopes are such a fun idea. Oh, this is too cute! 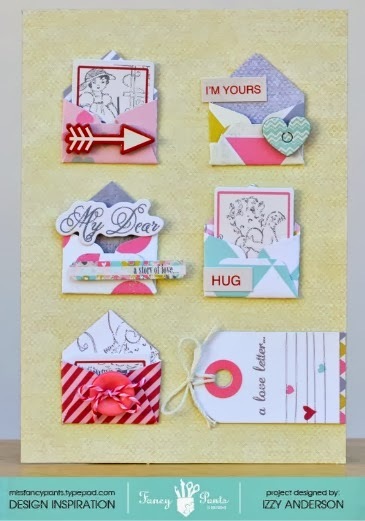 Love what you did with that envelope punch! This is too cute, Izzy!! Love those mini envelopes!